The cast of “The World Goes Round” at Salem Players. Photo by TH Squared Photography. You may not know the names John Kander and Fred Ebb as readily as, say, Richard Rodgers and Oscar Hammerstein, but you surely know at least some of the marvelous songs this songwriting duo wrote for the likes of Liza Minelli and Barbara Streisand over the years. 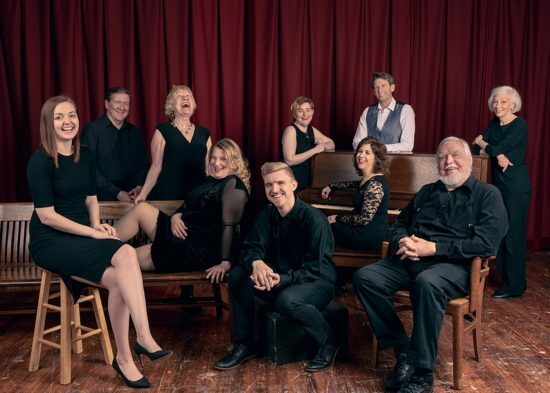 Salem Players has assembled a stellar ensemble of ten vocalists who bring these, and some lesser-known Kander and Ebb songs, to life in this thoroughly enjoyable musical revue. Do yourself a favor and run to see this versatile group honor the memory of John Kander and Fred Ebb with a wide-ranging tour of their songs before this impressive musical revue closes next week. Director Tim Van Sant had the good sense to create a minimalist set, elegantly framed by floor-to-ceiling black and burgundy curtains, to keep the focus on the performers and their music. And the decision to let the audience see, almost in full view, the sparse but highly capable three-piece orchestra at the back of the stage, was inspired and, again, reminded us that the music is the thing. Van Sant’s quick but fluid transitions between numbers repeatedly achieved this same goal, as did adorning the cast in basic black with mere hints of tasteful color here and there. Musical Director Sterling Gray doubled as pianist extraordinaire and led his versatile percussionist Keith Amersbach and reed virtuoso Dave Booth expertly through the dozens of songs in a way which both gave the spotlight to the performers but also showcased their own immense talent as a trio. Lighting Designer Paul Timmel similarly applied a spartan touch to his lighting decisions, but in a way in which he was almost a fellow performer on stage. This was most evident in his clever use of “lighting as costar” during “Mr. Cellophane,” Kander and Ebb’s funny but touching lament from their classic hit, “Chicago.” Choreographer Adrienne Kraus Latanishen followed suit with smooth and skillful dance moves which were visually lively but did not overly tax the ensemble during their songs. All of the aforementioned experts aimed to shine the spotlight on the ensemble, and, boy, did they deliver. From the opening number, ‘The World Goes Round Reveal,” to the closing, multi-lingual version of Frank Sinatra’s signature song, “New York, New York,” this cast dazzled the audience with a range of songs from the comic to the sublime. One would think that a revue with as many as thirty numbers would bog down at some point, but this writer felt as if the evening just flew by. David Fries’ vulnerability was in full view as he touchingly bemoaned his lot as “Mr. Cellophane.” Paul Bell’s strong and steady voice delighted us with his powerful rendition of “The Happy Time.” Maxine Stitzer (who doubled as Assistant Choreographer) moved gracefully and stunningly across the stage in every number she appeared in. Chloe Scully had a unique stage presence and delivered all of her numbers with aplomb. “Marry Me” was a highlight in Act 2 and was performed passionately by Micah Krey and Sarah Garret Krey (married in real life, as it turns out). Micah’s amazing tenor voice was an aural treat whenever he took the stage, but it was particularly impressive in this song. Sarah uttered not one sound in “Marry Me,” but her face and movements elevated the number to another level. If there was any doubt, though, whether she could sing at all, her vocal chops were in full and stunning display near the end of the revue as she nailed “Maybe This Time,” Kander and Ebb’s masterpiece from “Cabaret.” Jane Nitsch provided much of the comic relief throughout the show. Her comedic instincts were spot on during all of her songs. This comedienne knows how to make a shrug, or a wink, or any gesture a seemingly effortless but integral part of her numbers. While all of the cast brought something special to the evening, there were three stand-out performances which deserve high praise. Jennifer Viets’ lovely, spectacular voice hypnotized the audience each time she took the stage. She has great range, both vocally and dramatically. Much the same and more can be said for Darren McDonnell. McDonnell has a magnetic on-stage presence. Whether belting out his solos or expertly supporting the other vocalists from the sidelines, he brings an actor’s sensibility to every number as well as an awesome, mesmerizing voice. Finally, can you say tour de force? Tricia Morgan lit up the stage each and every time she graced it. From her fabulous, powerful rendition of “All That Jazz” to her more subtle supporting roles with other ensemble members, she delivers the goods and then some. With a strong, beautiful voice and a confident actor’s presence much like McDonnell’s, she was an absolute delight to behold. Running Time: 1 hour 45 minutes including a 15 intermission. “The World Goes Round” plays through March 31, 2019, Salem Players— Salem Evangelical Lutheran Church at 905 Frederick Road in Catonsville, MD. For tickets call (410) 747-0720 or purchase them online.